It’s fat and flour, cooked and used to thicken sauces, soups, gravies and things of that sort. Its one the most simple things you can make but it’s also one of the most important tools you can have. Depending on what you’ll be using it with, you mix equal parts of butter or oil with flour and slowly cook it while you whisk the hell out of it. For 90% of the things you will use, you will need to know how to cook 3 types but it’s really not that big of a deal.The key to a good roux is SLOW AND LOW. Cook it slowly and on low heat. If you’re working with butter, keep in mind that it doesn’t take much to burn it. And you have to whisk the hell out of the entire time. It’s one of those things that you have to babysit the whole time but its worth it. Heat your fat and whisk in the flour. It should have a slightly thick and uniform consistency. It needs to be whisked so that the fat and flour blend and cook. For a white roux, you hardly cook it and all. This is used to thicken white sauces, cream based soups and anything that has a lighter flavor. 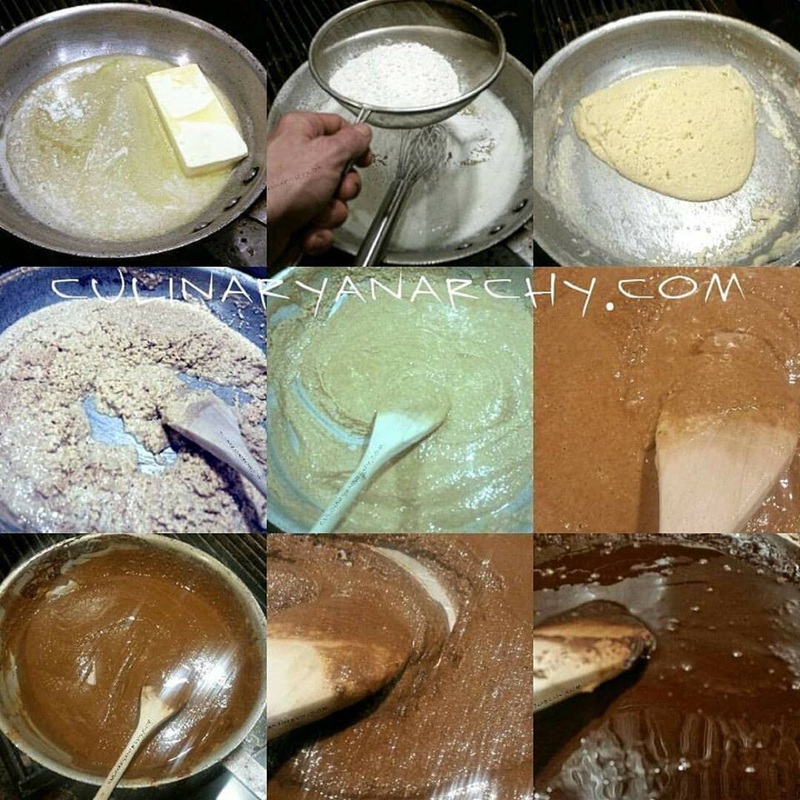 It’s the same process only you continue to whisk and cook the roux until the color turns, yup you guessed it, a light blond. This is a fairly general purpose roux that goes well with just about anything and at most Kitchens, I cook a pound or two at a time just to have it on hand when I need it. It has a bit more flavor since you’re cooking the flour and the fat and it will smell lightly toasted. Keep cooking and keep whisking. You really have to watch it and keep whisking so that the whole mix is cooked throughout and at this point, it can go from brown to fucked a lot faster than you would think. This roux gets a really rich and robust flavor that’s great to thicken gravies and stews with.Keep in mind that this stuff is hot and sticky and is often times called ” French Napalm” since it burns like nothing else. A good Roux is the backbone of a good sauce and most of the time all you need to do is add a bit to pan drippings and you’re set. It doesn’t take much so you need to add a little, whisk it and how thick things get. It’s just like Salt, a little will go a long way and you can always add more if you need to.